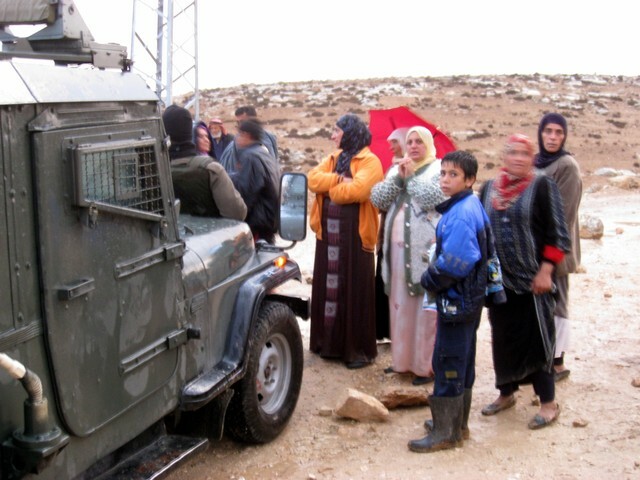 Residents of At-Tuwani Village block the path of an Israeli military jeep. Every time I return home after a vigil, I am asked, “How was it?” How does one answer? We were present? Ignored? Warmly greeted? Does it matter? The war goes on. Guantánamo remains open. Lies continue. We show up. We pray. We walk. So to attempt to describe my voyage with a Christian Peacemaking Team (CPT) delegation to Palestine/Israel in late November is more difficult to answer than the journey itself. I am blessed to have been led to this step by Catholic Workers and very dear friends. My desire to join a delegation elsewhere was rerouted by the suggestion that I should go to Palestine. As I have related many times, when Anne Montgomery—an 80-year-old nun who travels the world taking part in nonviolent direct actions—says go to Palestine, you go. I went. For 11 days, our delegation of seven—three women and four men, including a Briton, two Germans, a Canadian, and three Americans—jumped in and out of cabs, buses, hiked hills, climbed mountains, slept in hostels, caves, tents, met with lawyers, activists, shepherds, soldiers, teachers, settlers, and NGO human rights groups. We talked, vigiled, prayed. We learned. We tried to learn. For me, the more I heard, the more confused I became. I felt in the middle of a sudden death battle in which neither side would give in. But I also felt completely at home, welcomed. In Hebron, I went through a checkpoint. I showed my passport, as instructed and walked on. Then I heard the Israeli soldier manning the post call. I was sure he was yelling at me, but I continued. He called again, in Hebrew. I turned and he asked, “What state?” I answered and he waved me on. But it made me aware that if one does not speak the language of the occupier, one can most certainly be put in harm’s way. We moved from Jerusalem to At-Tuwani, Tuba, Hebron, Bethlehem and then back to Jerusalem. We toured part of East Jerusalem with the Israeli Committee Against House Demolition. We saw the huge discrepancy between Israeli settlements and Palestinian villages. We saw remnants of destroyed homes that were razed because people didn’t have a building permit—a virtually impossible item to obtain. It was always heart wrenching to see the rubble sitting on the ground, almost like a mass tombstone, a reminder that a family could be housed on that lot. Once given a notice of demolition the bulldozers can come at anytime, day or night, the same day or 20 years later—certainly a mechanism to squelch resistance. In At-Tuwani, we met the first of two CPT teams. At-Tuwani is a small village in the south Hebron hills. Built on a hillside (a small mountain to my aging knees) it consists of about 300 villagers. Electricity comes from a generator and runs only between five and nine at night. Its groan can be heard throughout the village, along with the various noises from roosters, mules and sheep. The grammar school sits atop the village and has been presented with a notice of demolition, punishment for building an addition to house more children. The village mosque was demolished but rebuilt. Overlooking the village is an Israeli settlement. Hidden deep within a foreboding forest, you cannot see the homes, only the massive electric security lights. Again, noting the disparity in living conditions, these lights burn all night. Each school day, approximately 16 children walk the road right in front of the settlement. Due to numerous occasions of settler attacks on these children, the Israeli military actually escorts the children past the settlement. An armored vehicle plus three soldiers on foot walked behind the children each morning we were in At-Tuwani. If the soldiers do not show up, the children must walk a more difficult, longer route to school. I reflected on the lost innocence of youth, having to come to terms with the stark nightmarish reality these children live under and wonder what path their future will take because of this way of life. CPT monitors these escorts the entire time the military and the children are together and armed with video cameras, they film any situations that occur. They also go out into the fields with the local shepherds and keep a lookout for potential attacks from settlers. The day before we arrived in At-Tuwani, one of the CPT staff, Laura, was attacked in the fields and hit on the head with a rock, requiring stitches. The police were called in and seemed to be stonewalling the investigation—a seemingly regular habit. But Laura did put herself between the shepherd and the attack of the settlers, securing the safety of the Palestinian. This sobering story was told to us after worship the evening before we arrived in At-Tuwani. I left deeply saddened. I missed my home, my community, my friends and the soup line. But I have never been so warmly greeted, accepted and tended to as by the strangers I encountered on this trip. I hope I can strive to be the same with those I encounter from here on out. In writing I can do no justice to this journey. I am awed to have been a small part of a delegation of voyagers. We each met looking for something different. We all came from different walks. But as one we saw the lives, heard the stories, and walked the neighborhoods. A part of me stayed behind. And I will return to reclaim it. I cannot say why. As I cannot say why I live at the Worker. I only know that God as led me. And I am thankful. Bud Courtney is a member of the New York Catholic Worker and Christian Peacemaker Teams.